Eleven years ago, Pete Hendrickson revealed the limited nature of the income tax, and how it was being systematically evaded by the State. Since then, tens of thousands of Americans have stopped playing along, and have recovered billions of dollars in improperly collected taxes. Also since then, the State has been engaged in a relentless effort to suppress Hendrickson's revelations, even while quietly but steadily acknowledging them with refund checks in mailboxes. Now the State has upped the ante, expanding its suppression efforts to outright attacks on the First and Fifth Amendment protections in the US Constitution. BETWEEN JULY 21 AND JULY 25, 2014, DOREEN HENDRICKSON was tried for a second time on a charge of resisting or disobeying one or both of two orders of a court requested in April 2006 by the federal government. One commanded Doreen to repudiate her previously-filed, sworn tax returns and replace them with new ones containing testimony dictated by the government. Doreen was ordered to swear to her personal belief in the testimony she was ordered to make and to conceal the fact that the returns she was ordered to make would be coerced and false. The other order commanded Doreen to not file tax returns based on the idea that only federal, state and local government workers are subject to the income tax, an absurd notion that the order falsely ascribes to 'Cracking the Code- The Fascinating Truth About Taxation In America' (CtC). If you're not familiar with the circumstances under which these orders were made you can learn about them here and here. (By the way, I was the target of the same orders, but have not been charged with contempt as my wife was. It is assumed that this is because I am recognized as being better able to defend against these absurd charges, due to being intimately familiar with both the circumstances in which they were asked for and issued, and with the relevant law, neither of which is true of Doreen. THE LIST OF ISSUES INVOLVED IN DOREEN'S EXECUTIVE/JUDICIAL MUGGING is very extensive. I'll discuss them rather organically. First I want to remind everyone that this recent trial in which Doreen was found guilty was her assailants' second bite at that apple. The first assault ended in a hung jury, which was, as is the common modern evasion of the double-jeopardy clause of the Fifth Amendment, deemed a "mis-trial" rather than what it really was-- a failure of the government to secure a conviction to the standards required under our Constitutional structure. But distortion of the Constitutional meaning of "double jeopardy" is routine these days. Here, we're going to look at things to which Doreen's assailants resorted which were "customized" evasions, abuses, distortions and outright frauds. Let's start with two especially egregious corruptions-- one surely unprecedented, and the other possibly unprecedented as well, but plainly wrong in any event. These two toppers are the instructions to the jury sought by the government and granted by the court prohibiting the jury from taking account of the unlawful, un-Constitutional character of the orders Doreen is accused of criminally resisting; and providing for a verdict of guilt even without a unanimous decision that Doreen had committed any one or the other of the acts of contempt with which she was charged. We'll look at the latter issue first, and what I'm going to present (as .pdfs at the links) are the government-proposed instruction on unanimity of verdict (which was adopted by the judge, just like in the first trial), and the counter-proposal we made (the proposed instruction is the double-spaced text on the first page; the material after that is the legal argument presented to the court on its behalf). Reading through each in turn, you'll notice that the government's proposal declares itself to be based on Sixth Circuit Pattern Instruction 8.03(b), but is actually exactly what that pattern instruction says is NOT valid (among other problems). Read our proposal carefully, and see if you don't agree. MOVING TO THE "LAWFULLNESS" ISSUE, here is the government's proposed instruction (also adopted by the judge, again, just like last time), and here is ours (again, the proposed instruction to be given to the jury is just the double-spaced text; the remainder is the argument to the court on its behalf). In this case, you'll note that the government glosses over (in fact, tries to obscure or conceal) that "lawfulness" is an explicit, statutory element of the offense. Just to round out the "lawfulness" issue, look at the government's proposed "elements of the offense" instruction (again, the one adopted by the judge) and ours. These will make clear the difference the government was trying to achieve in its burden of proof by its bogus 'lawful' instruction as compared to its proper burden. Recognizing that even with all the rest of its assaults on the rule of law and due process it was going to lose, in the last minutes of the "evidence phase" of the trial government attorneys waved documents in front of the jury which they claimed were proof that Doreen's testimony the previous day had been false. Doreen was unable to respond effectively at the time due to the circumstances and the nature of the misrepresentation, which therefore had its intended effect. But the misrepresentation WAS just that, and is readily proven to be, even if the only opportunity to make that proof is after the trial. In fact, perhaps unbeknownst to these schemers (who likely conceived this fraud in desperate haste), one of the documents used to deceive the jury actually contains proof of the truth within its own pages. (On the other hand, maybe this WAS known. The government attorneys, with the cooperation of the judge, managed to use the documents to attack Doreen, but then kept them from ever actually getting published to the jury). Here is the motion and brief laying out the fraud (as the first argument item in the brief). Relevant exhibits are here, here, here and here. 3.) that the government's 2006 civil lawsuit on which Doreen's prosecution is based, and which was brought under the fraudulent premises that refunds made to Doreen and me in 2003 and 2004 were just "mistakes" (and that CtC argues that only federal state and local government workers are subject to the income tax, and that "wages are not income"), was just a continuation of this corrupt suppression campaign after the first efforts had failed (as was my own kangaroo-court prosecution a few years later on charges of not believing what I've now written three books about, in which the government relied heavily on that same lawsuit to secure the outcome it was after, and as have been these two recent assaults on Doreen). See the government response here; and the reply here. See the denial issued 3 months later here; and the Motion for Reconsideration detailing all the evasions in the denial here. ALL YOUR FEEDBACK ON THESE ASSAULTS ON PROPRIETY AND THE RULE OF LAW is most welcome, and please-- share these with every journalist and legal professional you can. Include an introductory note or letter encouraging your correspondent to recognize that these remarkable distortions are not being undertaken by the government for a case that is merely about someone's alleged tax liabilities, or issues with her forms, or for alleged "contempt", as its creatures want everyone to imagine. Encourage your correspondent to recognize that these bizarro-land excesses are because the government feels a very dire threat looming over its long-running "ignorance-tax" scheme from CtC and its growing and ever-more hardened community of educated Americans. Encourage these legal professionals (and journalists, for that matter) with whom you are corresponding to recognize that they need to learn all about this and begin standing up for the rule of law with the rest of us. Why would you think top tax-division attorneys from the Department of Justice in Washington would be flown repeatedly to Detroit, Michigan to battle it out in two trials of a lone woman, representing herself, with an allegation of an improper refund claim of only $5 as part of the charge in the case? Would you really think the case is a "tax case"? Why would you think that the government would ask a federal judge to order two Americans to create "amended tax returns" years after the three-year window for such returns was closed? Why would you think the government would also order these two Americans to say specific things on the coerced returns-- things which these folks do not believe to be true-- and to sign the returns falsely declaring themselves to believe these dictated things, and what's more, order them to conceal the fact that these expressions are dictated by the government? Why would you think the high-falutin' Washington specialists would resort to asking the judge holding the lone pro se woman to trial for resisting these plainly First Amendment-violating, perjury-demanding orders to instruct the jury in the case, both times, that it could not consider the un-Constitutionality of the orders in its deliberations as to whether the woman really committed a crime by resisting them? Why would you think the high-falutin' Washington specialists would resort to asking the judge holding the lone pro se woman to trial for resisting these plainly First Amendment-violating, perjury-demanding orders to instruct the jury in the case, both times, that it need not unanimously agree that the woman actually violated any order in order to find her guilty of contempt? Why would you think the high-falutin' Washington specialists would resort to an outright evidence fraud during trial, misrepresenting a set of documents shown to the jury and then never introducing them into evidence (but happily, leaving copies in the hands of the defense, which allowed the fraud to be exposed after trial)? If I've got YOU asking too, now, please go to http://losthorizons.com/Documents/The16th.htm and read that page through. You'll learn what these high-falutin' Washington specialists are really going after with this unprecedented case, in what is just the latest in a more than ten-year effort to frighten Americans away from a truth the government finds it really inconvenient for us regular folk to know. You'll learn that this inconvenient truth REALLY IS truth-- as you'll see that the government has been routinely acknowledging for just as many years as it has been running this suppression campaign. C'MON, FOLKS! Let's turn the thuggish disrespect for the rule of law to which our enemies resort against them, and make some sweet and satisfying lemonade here! P. S. An outreach article written prior to Doreen's trial can be found here. It analyzes and presents the issues from a different perspective, and contains links to a number of pre-trial motions filed in the case which illuminate various aspects of the whole affair in ways other than what is presented above. Those looking for a more complete picture, or for more handles with which to grasp and communicate what this is all about will find this document useful. FORCING SOMEONE TO DECLARE herself indebted to another party-- whether by court order or threat of penalty for not making such a declaration-- is not a legitimate, lawful act of any organ of the state. Instead, it is a corrupt, tyrannical act, and prohibited by the United States Constitution's speech, due process and equal protection provisions. COMPELLING SOMEONE TO DECLARE A BELIEF that her earnings are "income" taxable by the United States is compelling her to declare herself indebted to the United States (or to declare her agreement with material facts under which the tax debt then arises as a matter of law). Compelling someone to declare her earnings on a line in the "income" section of a testimonial document like a 1040-- whether by direct command or by threat of a penalty for not doing so-- is compelling her to declare a belief that those earnings are "income" and subject to the tax. IF SOMEONE'S EARNINGS ARE actually subject to the tax as a matter of law, and the government is aware of them sufficiently to command their declaration on a 1040, there can be no legitimate purpose for compelling their declaration, even were doing so not Constitutionally prohibited. Such an effort to compel can only serve a government interest if those earnings ARE NOT actually subject to the tax as a matter of law. Earnings actually subject to the tax are so subject whether the recipient agrees or not. Compelling agreement with that fact is pointless as well as illegal. All the government needs to do is create its own return declaring the earnings to be "income" over a sworn signature-- which it is, in fact, required to do by law if the recipient of the earnings hasn't already agreed to the tax. Needless to say, this is both simpler, cheaper and easier than attempting to compel agreement from the recipient, and involves no Constitutional issues. (And again, it is mandated by law in any event). Compulsion of declared "agreement" is only of use to the government where the earnings in question are NOT actually taxable. Its purpose is to eliminate the recipient's ability to dispute the application of the tax to those earnings, and allow the government to proceed as though those earnings are taxable as a matter of law. Declared agreement creates a false appearance of "no dispute over material facts". The government is relieved of what otherwise would be its burdens of proof (or, more exactly, its obligation to walk away from the untaxable earnings and confine its attention to gains legitimately subject to the tax, in regard to which no coerced fiction of agreement is needed). The tax can then collected-- improperly, but with a superficial appearance of legitimacy which is impenetrable by anyone not educated about the actual objects of the tax and how it is applied under the law. Wrong. It IS happening here, right now. And you'd better pay attention and get involved. HERE'S THE STORY: In 2006, the government was faced with the fact that CtC had laid bare its then-70-year-old "agreements secured by ignorance" program. Under that regime, Americans had for decades been misled into declaring their earnings to be subject to the tax with no illegal compulsion necessary, simply due to having no idea of the actual limits of the tax and of the legal effect of listing their earnings as "income" on a signed 1040. Thanks to CtC, Americans were now declining to "agree" in ever-increasing numbers, and were routinely using those 1040s to instead demand-- and receive-- complete refunds of what had been inappropriately withheld from them in connection with the tax, Social Security and Medicare taxes included. The "ignorance-tax"-addicted-State's first response to CtC's revelations was an effort to suppress the book by injunction, which was defeated. In desperate response, the DOJ and IRS launched a project to test the depths to which judicial co-option would allow them to go in attempting to replace ignorance with compulsion. The DOJ filed a lawsuit against me and my wife, Doreen. It falsely claimed that refunds made to us of what had been withheld from me in 2002 and 2003 were just mistakes. This claim was made despite elaborate IRS fussing over those refund claims before they were honored and despite the government's inability to produce even an actual IRS "examination report" disputing our claims (it presented the court with a fake one, instead). The claim was made even though to this day-- more than eight years since the suit was brought, and more than seven since the ruling for the government by the compliant court to which the ploy was entrusted-- the government's own Department of Treasury acknowledges that our refunds are correct, that nothing taxable was received in those years contrary to our returns, and that no tax has ever been owed. But the government had a "workaround for these problems. It asked the judge to declare "findings" of every "fact" alleged by the government, and to order Doreen and me to swear to agreement with them by replacing our freely-made tax returns with new ones on which we were to declare our belief in the truth of these "facts" (and to conceal that these declarations were coerced). Further, because attacking CtC was the sole and real purpose of this suit, the government also asked for a "finding" that CtC claims that "wages" are not "income" and that only federal, state and local government workers are subject to the tax, and for an order prohibiting Doreen and me from filing returns based on these absurd notions falsely ascribed to the book. Together, the "findings" and the two orders would equip the DOJ and IRS to crow that "a court has ruled against CtC!" We appealed, of course, but the appellate court responded by granting a government motion barring our memorandum detailing procedural flaws from being considered or going into the appellate record. This allowed the appellate panel to deem all the "found facts" to be true, and to therefore justify a denial of the appeal. The Supreme Court elected to not make our case one of the .007% of petitions received each year it would hear. THUS FREED FROM FEAR THAT A COURT would act to stop it (and there being virtually zero attention to any of this in the media), the DOJ doubled-down. In late 2008, it charged me with filing "false returns" based on the proposition that I didn't really believe my earnings shouldn't be declared as "income" (under the "wages" label or otherwise) on my tax forms. The government's key "evidence" was 743 pages of government filings in the lawsuit. All were admitted by the judge without a testifying (and examinable) witness involved; the docs with all their government-serving allegations and conclusions were just handed over to the jury. The featured item was the ruling by the court in that suit, in which my earnings were "found" to be what the government had asked the court to say (and CtC was "found" to say what it does not). That was not enough, though-- the government also felt obliged to deny the jury the actual statutory definitions of things like "wages", and to have it specifically instructed to deliberate using prosecution-written substitute definitions which essentially declared my earnings to be "wages" (unlike the actual definitions), and obliged the jury to conclude that I must have believed my earnings to be "wages" when I said by way of my forms that I didn't. In June of that year my wife Doreen was arrested and charged with "criminal contempt of court" for alleged willful disobedience to the orders issued in the lawsuit 6 years prior. That is, Doreen was charged with a crime for not letting herself be compelled to declare a belief that her earnings are subject to the tax. Even then the government knew it couldn't get a guilty verdict. So it also asked that the jury also be told it needn't unanimously agree that Doreen had actually committed either of the two distinct acts of contempt alleged in the indictment-- one, failing to submit "amended returns" for 2002 and 2003 declaring a belief that her earnings were taxable, and two, filing a return the government alleged was based on the absurd notion falsely ascribed to CtC that only federal, state and local government workers are subject to the income tax (this was a return filed in 2009 for a $5 refund of withholdings from Doreen's $59 of W-2-reported earnings in 2008, which the government, after its standard thorough vetting of her claim, had duly issued). This wouldn't do for the tyranny-interests, so they tried a second time, in July of 2014. Again, Doreen defended herself. Again, the special instructions were given to the jury removing the "lawfulness" issue (even though it is a specific statutory element of "contempt" crimes) and sparing the government from its actual unanimous verdict burden. But this time the government also saw to it that Doreen was not permitted to make her Opening Statement, or to finish her Closing Argument. This time she was prevented from citing and reading to the jurors Supreme Court opinions on speech rights specifically declaring unconstitutional orders like those she was accused of believing herself to be under a valid legal duty to obey but violating anyway-- the legal standard for a contempt charge. All of the foregoing should be enough to outrage and make deeply concerned any and every adult American. 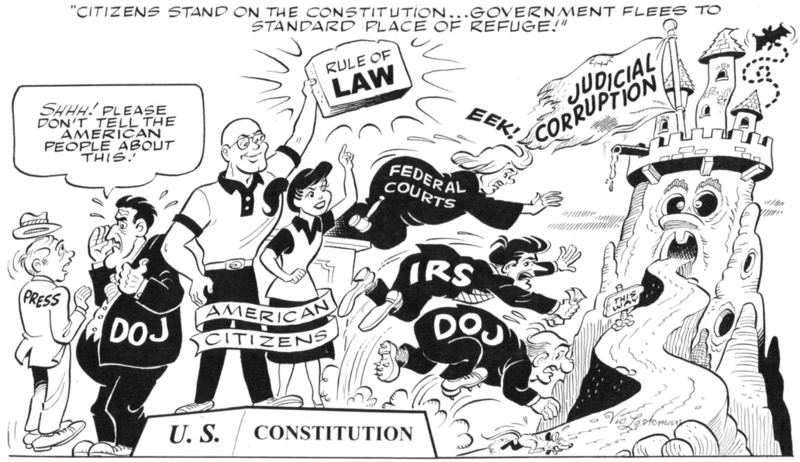 Plainly, this is a horrendous assault on the rule of law, and one being practiced in order to keep everyone from learning about the most significant government scam and abuse in our country's history-- the systemic mis-application of the income tax to the tune of trillions of dollars scammed out of the pockets of their rightful owners and into the hands of the political class and its clients and cronies. But there is one additional aspect of this assault on the rule of law that goes even beyond just the First Amendment and due process/equal protection issues, and the purely practical issues of all that money being snookered away. This other thing, which ought to chill you to the very bone if you've got your wits about you, is this: The concept rested on by the government for why it was okay to dictate and command Doreen's statements of belief was that she is only being told to say what she herself really believes to be true. After all, a judge has said it. Therefore, Doreen must believe it, too. Over and over, throughout the trial, the US attorneys kept saying Doreen was only being ordered to "say what was correct". Their Closing Argument was little more than pounding on the podium and shouting that Doreen was told what was correct by the judge, and so how could the jury imagine that she could honestly believe otherwise?! An "official" has said it, therefore it must be true, therefore you can be forced to say you believe it, too-- even on a legal form that controls who gets to keep or claim your property. That's exactly the same sick and twisted crap we once rightly denounced in the old Soviet Union, where people who dissented against the party line were deemed mentally ill and made wards of the state, without rights. Here it is in America-- if you don't do something about it. SO HERE'S THE THING, PEOPLE-- THE ONLY THING THAT MATTERS NOW. On April 9, at 12:00PM, in the courtroom of Victoria Roberts in the Theodore Levin Federal Building in downtown Detroit, my good and beautiful Doreen is due to be sentenced for the alleged "crime" of not letting herself be compelled to declare a belief she does not hold but which the government wants her forced to avow in service to its interests. Be there, making yourself heard and seen, and until then, be raising one hell of a racket with journalists and the legal community-- especially organizations that profess to be "public interest". If not, don't cry to me when your turn comes.